Do online gay dating websites work? To answer your question simply, yes, gay dating websites do work. A recent Advocate survey found 88% of gay men are open to or actively seeking a relationship. So where’s the best place for all of these singles to find one each other? Online dating, of course. There are a number of great online dating sites for every taste. The members in these online dating communities may come from different gay scenes but they all have one thing in common. Online dating is all about marketing. And the most successful guys are those that know their market and the product they’re presenting—themselves. One of the basic human impulses is to develop a romantic relationship – and maybe even fall in love. But there are a lot of obstacles that might keep a gay person from meeting the love of his life in today’s world. Maybe dating co-workers is against company policy. Perhaps you hate the bar scene. You might not be in the right mood to meet your soul mate while you’re trekking through the grocery store. People of all ages, lifestyles and locations have been facing this problem for decades. In the last 10 years or so, a new solution has arrived to help lonely hearts find their soul mates: online dating. Everybody’s at it. 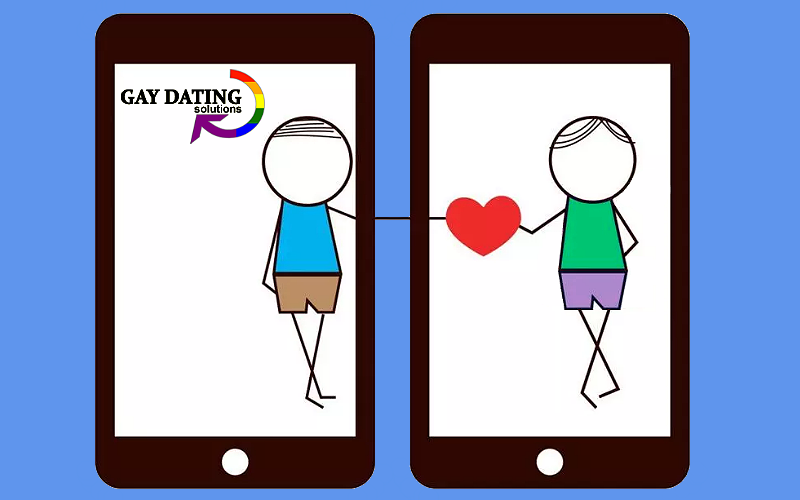 Back in the ancient history of online dating there were far fewer people online, and there was a smaller range of gay people dating online, but that time has long passed. If someone you know sees your profile, the first thing to remember is that they’re almost definitely in the same boat as you, and that they probably know you’re single already. Being pro-active about finding a date isn’t something you shouldn’t be sheepish about. Instead of sitting at home, complaining about single life, you’re actually acting on this feeling to do something about it. This is brave and bold, so remember that you are doing this for you, not anyone else, and know you should feel empowered by your decision rather than embarrassed. The best thing about online dating is that you can get to know someone before you decide to meet them. Winking and sending messages can be really fun, but you do have to be responsible to ensure you have a safe and successful experience. At Gay Dating Solutions they do their very best to ensure the personal safety of their members and have some simple steps below to keep you safe. Take time to get to know your date: dating websites give you the opportunity to date at your own pace, so you can take the time to really get to know someone. If you don’t want to share your personal contact details, keep your conversations on the app or website. Be in control: You’re not alone in your dating journey, at Gay Dating Solutions it is their job to help you. If something doesn’t feel right, you can let them know straight away by alerting them the issue. Recognize the warning signs: This is as much about intuition as it is about being aware of a few key flagging points. Never give out confidential details. Be date smart: When you do go on a date be smart about the location you choose. Make sure it’s in public and that you’ve let someone else know where you’re going. While the cost of pay sites can be a disadvantage, it also ensures that only people who are really serious about finding a date will join the site. Because these sites take credit card information to process payments, they can also put into place various identity verification measures. Pay sites often allow users to post a profile and browse the profiles of others for free, but only paying members can initiate contact. In addition to the ability to contact people through their profile, a paid membership often grants access to more advanced features of the site, such as better profile searches or a higher ranking for your profile when it comes up in other users’ search results. If you’ve decided to become a paying member of a gay dating site, you can start contacting other users if their profile appeals to you. These messages don’t have to very elaborate, since you’ve already put a lot of information into your profile. Something along the lines of, “Hey, I saw your profile and it seems like we have some common interests. Take a look at my profile, and if you’re interested, send me a message,” is probably sufficient. You might send messages to several people at once, or you might contact one at a time – it’s up to each user. From there, you simply wait. Some people will write back to let you know they’re not interested, while others will simply ignore your message. In some cases, the person you wrote to might not be visiting the site anymore. But a few of your contacts will eventually respond, and other people will start contacting after they see your profile. How long it takes depends on the site and the individual user. Reports from dating-site users range from one who cited a ratio of “about a million to one” contacts to actual dates to another who had two dates almost immediately and is still dating one of them. Once you’ve filled out a profile, online dating sites will provide a list of matches — people they think you are compatible with. How do they decide who matches up with who? Sometimes, the process is very simple. Each profile has a list of attributes or interests that members check off. The more matching attributes that two profiles have, the higher “match percentage” the site will assign to it. Some sites, like GayDatingSolutions.com, take the matchmaking process a step further. They have a 27 item personality questionnaire which allows them to do your Preferred matching. Your responses to the questionnaire will show how best to pair you with men from the base list who would be a good fit for you. You then have a base list but also a Preferred List to begin dating. Fortunately, the main advantage of online dating is that it gives each user control over who they contact and with whom they subsequently communicate. It might take more work than relying on the site’s matching system, but browsing through profiles yourself may ultimately be the best way to find the right person. If you are serious about dating, Gay Dating Solutions is the right dating site for you. We believe that finding a compatible partner – who genuinely suits your lifestyle and dating preferences – is crucial for your lasting happiness. Thousands of single gay men find love through their services each month. Register today.